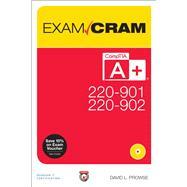 This is the perfect study guide to help you pass CompTIA®’s new A+® 220-901 and 220-902 exams. It provides coverage and practice questions for every exam topic, including substantial new coverage of Windows 8/8.1, new PC hardware, tablets, smartphones, OS X, Linux, cloud computing, and professional-level networking and security. Extensive prep tools include quizzes, Exam Alerts, our great last-minute Cram Sheet, two full practice exams in the print book and an additional two exams in the test engine, plus complete real-time practice and feedback through Pearson’s state-of-the-art test engine. You’ll also find ten exclusive Real World Scenario case studies, all linked to simulations or video on the DVD! Covers the critical information you’ll need to know to score higher on your A+ 220-901 and 220-902 exams! TEST ENGINE WITH 320 PRACTICE QUESTIONS! Make sure you’re 100% ready for the real exam! David L. Prowse is the author of more than a dozen computer training books and video products. He has worked in the computer field for 20 years and loves to share his experience through teaching and writing. He runs the website www.davidlprowse.com, where he gladly answers questions from readers and students.